I just got the Wedding Dance 5 Disc DVD Set from SalsaCrazy and I love it! This is a really great instructional set that teaches you how to do different ballroom dances it teaches the foxtrot, waltz, swing, and rumba. It’s great for someone who needs to learn how to do these dances for a wedding or big event. I love to dance so things like the wedding dance set are great for me. It’s a great way to learn these dances for your big event. It reminded me a lot of classes I have taken before that teaches basic dance moves and steps! It’s really fun, upbeat, and it makes you feel great when you are finished. The instructions are clear and easy to understand even if you have never done the dances before. I highly recommend this for anyone that is wanting to learn how to do these ballroom dances. Be able to dance to any of your favorite first dance wedding songs, and feel confident doing it! This wedding dance video will teach you all the popular styles of wedding dance so that you can tons of different wedding dance songs , and know how to dance to all of them. 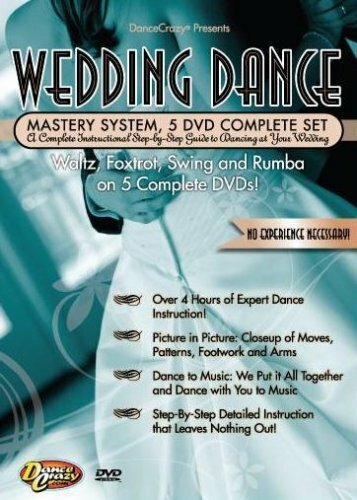 DanceCrazy presents the perfect instructional guide to your first wedding dance, and your first dance as husband and wife. With complete preparation for each dance (Waltz, Foxtrot, Swing, and Rumba), we also include an enormous amount of extra material to cover every aspect of your dance. Every question you have will be answered with our in-depth discussion and overview of key concepts and practices that pertain to dancing at your wedding. We take you step by step through each dance, break everything down for you, dance it with you together to real music, and finally give you additional tips for success! We even put together some great patterns for you to take with you onto the dance floor! DanceCrazy’s Wedding DVDs are for even the absolute beginner!